I'm a little bit of a makeup junkie, and I've switched up a lot of the products I normally use for summer. Here are some of my favorite products! 1. Bobbi Brown's Extra Repair foundation gives beautiful flawless coverage that's buildable, and it's really moisturizing. I have slightly oily skin but it doesn't make me too shiny. This is my favorite foundation I've ever used! 2. Guerlain Meteorites. I've been using them for years, my mom turned me on to them. 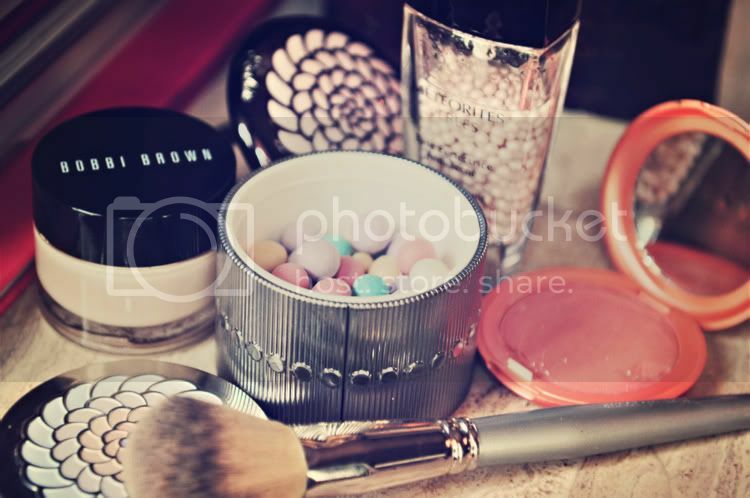 The slightly shimmery pastel color corrective powders make you look radiant. 3. Guerlain Meteorites Light Diffusing Perfecting Primer. This product was sent to me by the sweet people at Guerlain, and its completely unlike the other slippery silicone primers that are out there. 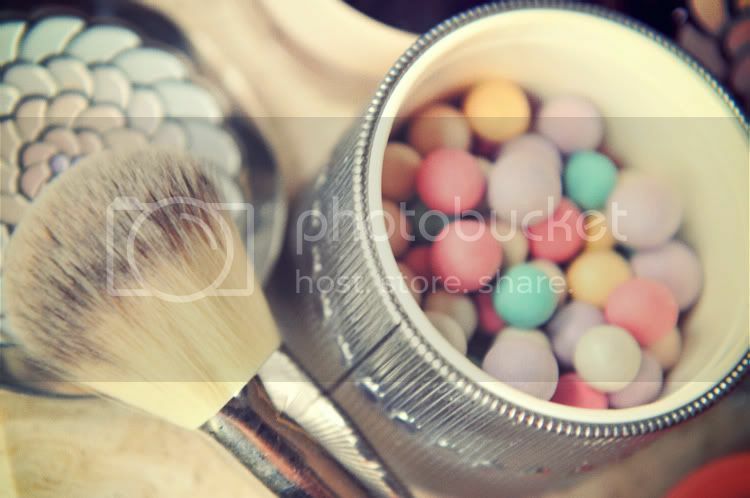 This makes your makeup last forever! 4. Stila Convertible Color in Lillium. Perfect thing to throw in your purse when you go out, you can dab a little of this cream color on your lips and cheeks. I know so many girls who love this. 5. 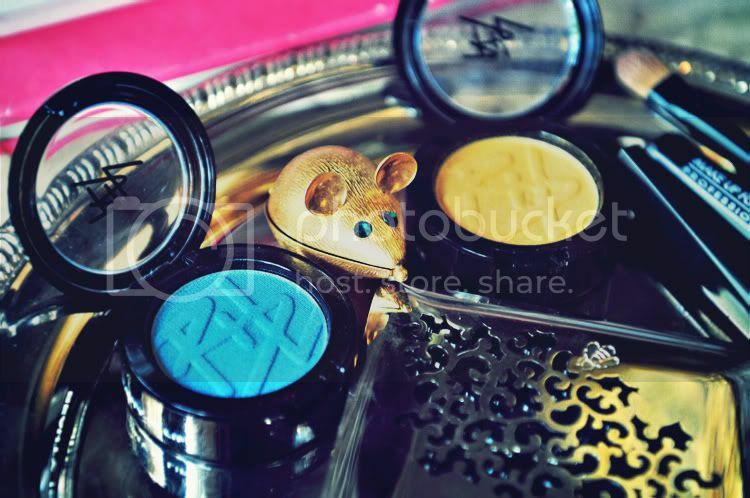 Guerlain Face Powder Compact. This was another product sent to me by Guerlain and I carry this in my purse whenever I go out because it blots out shine and gives a little sheer coverage. Also, it's super pale! I have such a hard time finding pale products. 6. 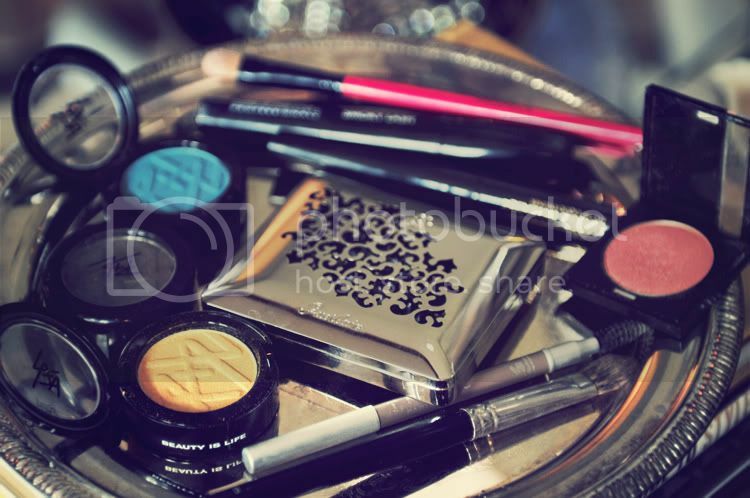 Beauty is Life eyeshadows. I am in love with this beauty line, and their amazing color range. I never thought I'd be wearing baby blue and yellow eyeshadow, but these colors are too pretty to pass by and I've gotten a lot of compliments on them. The blue is called Sailor, and its a pale Anna Karina-esque color. The yellow is called Gold. 7. Guerlain's Six Color Beauty Quad. not only does this come in gorgeous old Hollywood style packaging but the pallette range is exquisite. Guerlain also sent me this product. 8. T Le Clerc Eye Brow Pencil in Blond. I'm pretty nuts about my eyebrows and this pencil is perfect for shaping. 9. Cle de Peau Eyeshadow Quad in Thulite. I love doing a pale shimmery pink on the lid and smoking out the creases with grey. It's a little bit of a sixties pallette! It's my new everyday look. 10. L'oreal Lineur Intense liquid eyeliner. If you find liquid eyeliner challenging like I do, you'll love this. It's so easy to control. 11. 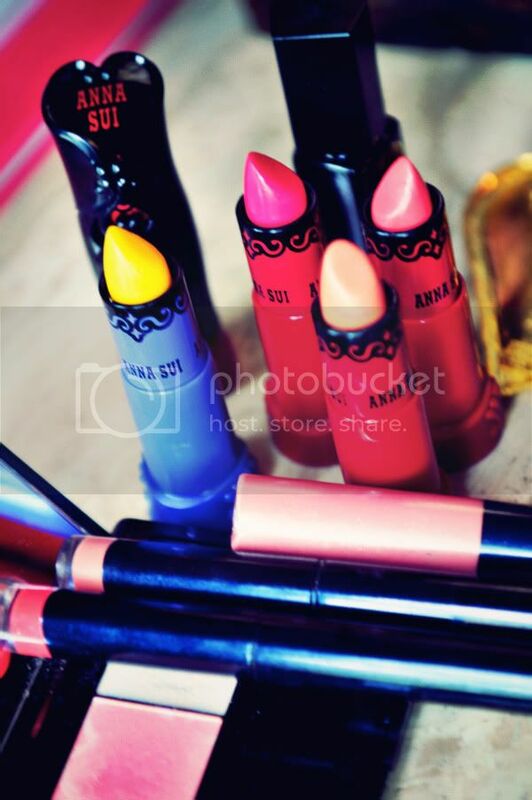 Anna Sui's Vivid Lipsticks. I know it sounds cheesy but the colors are all very 'fashion forward'. There's Barbie pink, peachy nudes, black, and everything in between!! I love these, they were sent to me by Urban Outfitters a long time ago. The Rouge lipstick range looks very nice too. 12. Cle de Peau Silky Lipsticks. Half gloss half lipstick in really gorgeous colors. These last forever. My sister turned me on to these. 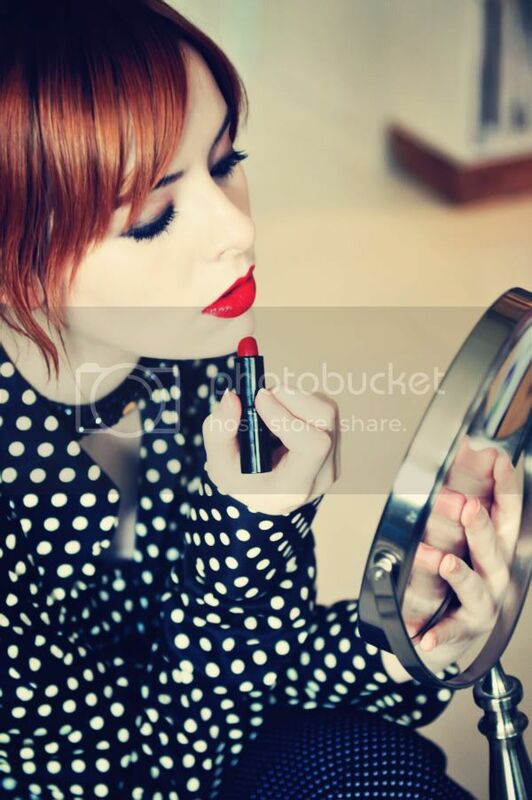 My new favorite red lipstick is Beauty is Life's lipstick in Royal 24. It's got a touch of orange in it that makes it a little 70's and not at all clownish. Before I sign off, I do have one more reccomendation, especially for those living in hot climates. Urban Decay's All Nighter Long-lasting Makeup Setting Spray. It keeps your face in place, no joke. Hope this answers any questions, you can tweet me if you want to know anything else! P.S. If you haven't watched any of Pixiwoo's makeup tutorials and feel a little lost when it comes to makeup application, I highly reccomend them!! I've gotten so much better at my makeup just by watching them.